What the folk is going on with the youths of America? The folk music revival was carried by and largely served the young men and women who were raised to volunteer, organize civil rights protests and activist groups and work with political powers (at least at the start) to effect the change they envisioned for the world. These college-age individuals rejected commercial mass culture while they favored borrowing and adapting older music from previous generations to serve their own purposes. Today, we still see (or hear of) people borrowing from other musical ideas and traditions. What they borrow leads to commercial success––in the case of Amy Winehouse and Iggy Azalea. Artists borrow ideas for several reasons: they identify with some aspect of the idea or culture, to make money, necessity demands that they adapt their music to today’s pop standards by updating the sounds or affect they use, or, to make a statement. We are in a never ending cycle of cultural repetition. Everything we produce and consume will reoccur in another form some time (shortly or long after) the “original” was produced. However, the questions have not changed from the 1970s when the folk music revival was in full swing, nor from when bluegrass was in its developmental stage as a musical genre. What is the intent behind artist’s borrowing ideas from others and how many alterations must the new work undergo before it is something original? Is there a way to respectfully reproduce or change something when you yourself have not been around to experience the genesis of that idea or have little to no connection with that cultural movement, people, or idea? And what is the significance of festivals? What role do they play with the appropriation, adaptation and spread of ideas and are they important cultural hub or a temporary collection of society’s social outcasts and wannabe reshapers? 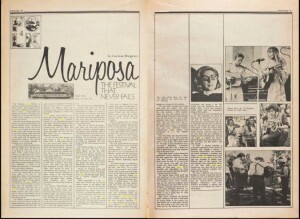 The Mariposa music festival still is around today. This year, the festival’s dates are July 3-5, 2015. 1. Musgrave, Corinne. 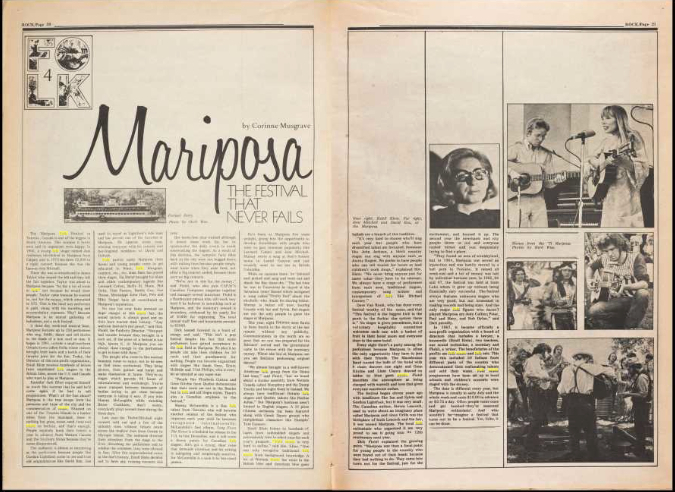 “Mariposa: The Festival That Never Fails.” Rock, 1972 3, no. 10 (1972): 20-21. 2. Crawford, Richard. America’s Musical Life. New York: W. W. Norton & Company, 2001.